Since he was a kid, Lee Pearce has been around the water and boats, but he didn’t discover sailing until he was around 30-years old, living in Florida. He made his way to the shores of California where the sea became a more prominent part of his life. 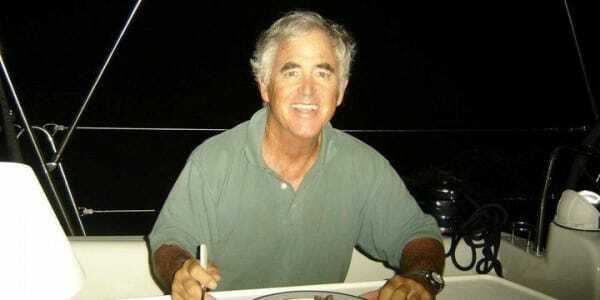 There, he earned his USCG Captain’s license and started teaching sailing part time on the weekends. Pearce soon found his groove and realized he could be more than a part time instructor and took the plunge, starting his own sailing school, Learn to Sail San Diego, and that’s where he’s been teaching for the past 15-years. He’s a dedicated and skillful teacher and has been recognized as one of ASA’s Outstanding Instructors. 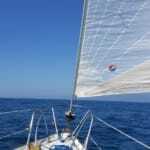 Although he spends most of his time sailing in the idyllic sailing conditions of Southern California, his most adventurous sailing came on the east coast. On a boat delivery from Charleston, SC to the British Virgin Islands where Pearce and crew battled winds up to 50-knots and waves as high as 30′ for 24-hours straight. “It was a following sea in a 40′ Beneteau,” Pearce said of the experience. 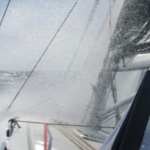 “We took the main down completely and sailed with a mostly furled jib. The boat handled beautifully and I was never in fear that we might loose control. It was an ugly open ocean stretch but the destination remains his favorite place in the world to sail.